He names some great Jesuits, many of whom I know and one of whom was also one of my profs at the Augustinianum. I studied St. Hillary of Poitier with him. As a matter of fact, Fr. Giles Peland provided us with knock-out argument and quote against the dreadful proposals of Card. Kasper and Company. HERE Happily, it also applies to the quixotic suggestion that women should be ordained as deacons. Father also mentions Fr. Paul Mankowski, one of the contributors to the extremely important book Remaining in the Truth of Christ: Marriage and Communion in the Catholic Church (US HERE – UK link HERE – published by Ignatius Press founded by Jesuit Father Joseph Fessio). “We would believe ourselves guilty of a great crime in the presence of God, if, in these so grave necessities of the public interest, We were to neglect to put to work those salutary helps which God, with singular providence has provided Us, and if We, placed in the bark of Peter, tossed and buffeted by continual storms, were to reject the expert and valorous rowers who offer to break the waves of a sea which at every moment threatens Us with shipwreck and ruin. If you want the Latin of that quote, above, get a load of this! Gravissimi enim criminis in conspectu Dei reos Nos esse crederemus, si in tantis reipublicae necessitatibus ea salutaria auxilia adhibere negligeremus, quae singulari Providentia Deus Nobis suppeditat, et si Nos in Petri navicula assiduis turbinibus agitata et concussa collocati, expertos et validos qui sese Nobis offerunt remiges, ad frangendos pelagi naufragium Nobis et exitium quovis momento minitantis fluctus, respueremus. Wow. Those guys could really write. Be sure to check out Father’s good post, especially his final sagacious comment. Meanwhile, more about the 1814 bull Sollicitudo omnium ecclesiarum. 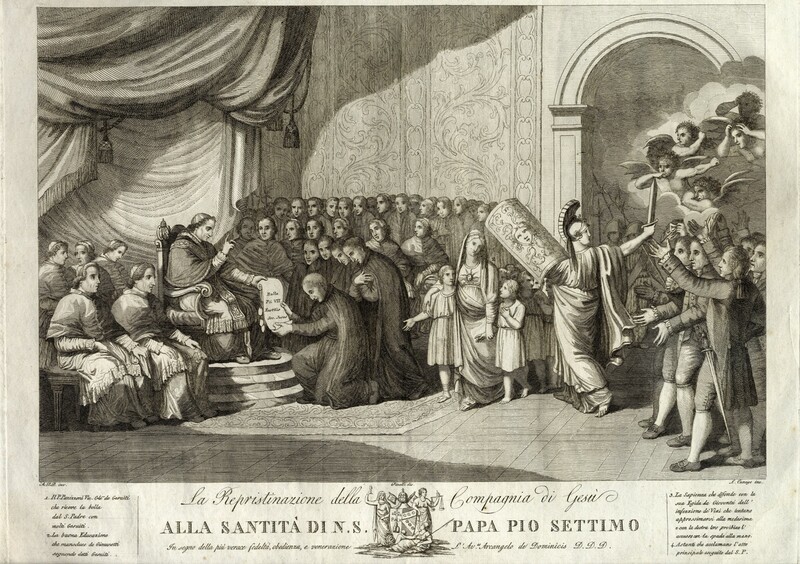 Pius VII had already recognized that the Jesuits were still in existence in Russia, where Clement XIV’s earlier suppression had not been implemented. He also recognized them in Kingdom of the Two Sicilies in 1804. So, Pius’ bull Sollicitudo omnium ecclesiarum did the same for the whole world, thus reversing Clement XIV’s suppression forty years before. So, on 7 August 1814, the date of the bull, Pope Pius went to the glorious baroque main church of the Jesuits in Rome, the Gesù, where, in the presence of prelates and nobility and a crowd of Jesuits, celebrated mass at the altar of of the tomb of St. Ignatius. After the Mass the bull was read and handed over to the superior of the Jesuits in Italy. More about all of that HERE. This entry was posted in Mail from priests and tagged 1814, Fr. Tim Finigan, Jesuits, Pius VII, Sollicitudo omnium Ecclesiarum. Bookmark the permalink. I would like to add Fr. Mitch Pacwa of EWTN service to the list if I may. I have always found him to be a great Bible scholar and homilist. The angels in that engraving look like they’re getting ready to tear their hair out. Fr. Pacwa is a great example of how a priest deep in the errors of many Jesuits can overcome the weeds and now greatly resists modernism. I would also add Fr. James Schall, and of course the late Fr. Hardon who had to endure some major crosses from within his order, but whose work still bears great fruit today. And Fr Fessio. And a few young ones I know of who I won’t embarrass by name. I nominate Fr. Ken Baker SJ, a wonderful preacher, translator, and emeritus editor of Homiletic and Pastoral Review. Fr. Baker served the Latin Mass community in Tacoma WA until it came under the care of the FSSP. And when you’d been to confession with him you knew it! Bouscaren, Cappello, Conn, Geisinger, Gallagher, Ghirlanda, Hill, Huth, Navarrete, Huizing, Orsy, Regatillo, Schmalzgrueber, Wernz, Vermeersch, Vidal, Zuzek, … just some of the many Jesuit canonists whose works and examples have helped make me the canonist I am today. One of my favorite historical Jesuits is Fr. Matteo Ricci, the first missionary to get into China. Fr. Gilles Pelland is still alive, as far as I’ve heard, and still active at 86. According to the website of his province, he’s even serving as superior of a community! Ah, Pius VII. If only you could have foreseen when you gave the bull to the Jesuits that so many of them in the Year of Our Lord 2017 would be giving the bull to us. . .
Will Cardinal Avery Dulles, SJ make the list? otsowalo, Dulles should make the list, if only for his book on Magisterium. I would like to add the Ven. Walter Ciszek, SJ, to the list. I pray for his canonization and have placed my vocational discernment under his heavenly intercession. I’m late to the topic here…I had forgotten about Fr. George Schultze, SJ, who was recently named Rector of St. Patrick’s Seminary in the Archdiocese of San Francisco. Do not worry about the seminarians being under his care. He’s one of the good ones with SJ after his name! One of the things Fr. Schultze mentions (around 14 minutes in) confirms a rumor I had heard–that recently ordained Fr. Alvin Yu will be helping out with liturgical training at the seminary. One of Fr. Yu’s First Masses was a Solemn Mass in the Extraordinary Form that may have been mentioned on these very pages. Now that’s something I want to see at the seminary!